Recently one of Wild Apricot’s service partners – Webbright Services – interviewed Dmitry Buterin, our Chief Apricot who offered “An Insider Look at Wild Apricot”. Here are some excerpts from the interview with Lamees Abourahma of Webbright Services as part of their Bright Association Press series. After six years of providing custom software development to small and large organizations (under the name of Bonasource), Dmitry Buterin decided he didn’t want to be in the service business and was looking for a product idea. “We did a lot of work for small associations and clubs and noticed common needs… need to keep track of membership, need for members to sign up for events, and need to be automated. “SaaS [Software-as-a-Service] looked like a very good opportunity” said Buterin, “let’s invest money upfront to build this software and have thousands, maybe hundreds of thousands, of organizations who can use it, and maybe build a business around it”. In 2006, Buterin came up with the name (Wild Apricot), built the software, and the rest is history. 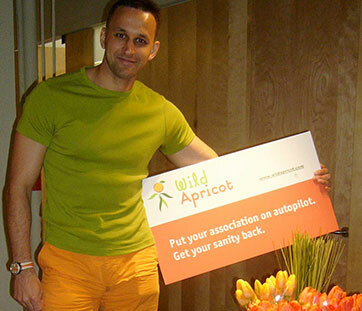 Wild Apricot has recently been ranked the #1 membership software company, serving over 6,800 paid membership organizations worldwide, with 70 team members in offices in both Toronto and Moscow. What Makes Wild Apricot Special? According to Buterin, there are two differentiating factors that make Wild Apricot unique: (1) Wild Apricot is a product-only company, and (2) Wild Apricot "listens". As a software company, Wild Apricot provides technical support for customers but relies on service partners, like Webbright, to provide additional services such as website design and development, consultation, and 3rd party integration. Wild Apricot strategically positioned themselves as a pure software company in order to focus on making the software better and more visible. “This is a double-edged sword,” said Buterin. “Wild Apricot is a complex software… for those customers who do not have the required skill set to setup Wild Apricot for their membership organization, they’re more inclined to go to our competitors who offer these services. [Furthermore,] our competitors have an additional revenue stream by having a service department in the company.” Even without the extra income from services, Wild Apricot is currently investing an impressive $250,000 per month on research and development (R&D), while offering monthly plans for customer on an average fee of $50 per month. In addition to the anniversary surveys, annual surveys, and other requests they get through customer support, Wild Apricot have an active forum, called the Wish List, where customers can request features they like added to the software and other customers can comment on these requests. Wild Apricot leadership closely monitor the Wish List, engage in discussions with customers to understand their needs, and use these requests to create their Road Map of features to include in future releases. …The biggest Wild Apricot release yet, release 5.0, is expected around May/June of 2014. “We’ve been working on this big update, release 5.0, and it has been a challenge. Once we have this release, we plan to expedite our schedule frequency of releases until the end of the year.” In Release 5.0, Wild Apricot is rewriting the entire content management system (CMS) from the ground up to give them more control and allow them to add more functionality not currently possible with the original technology. … For more details on what will be included in the Version 5 release, you can read Version 5.0 Preview on Wild Apricot online help pages. Want to check out the entire interview? You can read the full blog post or listen to the audio of the interview with Dmitry Buterin – “The State of Wild Apricot, Past, Present and Future” on the Webbright blog here.